without doubt, part of an effective way of solving them. If we need to deal with one of our life issues, we think it through, review our various options, and then choose a course of action to handle the problem. We can then take action to resolve the issue – and this might include redefining it so that we don’t experience it as a problem any longer. But sometimes we get stuck at the thinking stage of problem-solving and go no farther. The success of thinking can lead us to engage solely in thought, as if – if we do more and more of it – we can think our way through what seems to be an insoluble issue. We find comfort in thought itself and never move into the problem-solving strategy of taking efficacious action. What we may not understand is that rumination (or overthinking) is driven by anxiety. Letting thoughts swirl in our heads over and over again is one way to soothe our anxiety – but it’s a trap because we get stuck in our thoughts and never move on to take action to solve the problem. Rumination is more likely to occur when our thoughts are largely negative. Positive thinking encourages us to take effective action. Negative thoughts, on the other hand, because of social constraints and the negative impact they have on our self-image, discourage us from taking action. When we engage in negative thinking most of the time, we feel overwhelmed by the world. We feel stuck. We can’t see our way out of our problems. Negative thinking drives people away from us so that we are unable to share our thoughts with others and benefit from the feedback they might offer. And so, alone, we think – and think. We ruminate. Researchers have found that women are much more likely to ruminate than men. This reflects the two-to-one ratio of women who suffer from depression in comparison to men. There are a number of possible reasons why women ruminate more often than men, including socialization practices in our society, job discrimination, lower pay, and a greater incidence of abuse. In addition to depression, rumination is associated with anxiety, anger, and substance abuse. • Victimization – When we feel that we have been treated badly by someone, we ruminate about the injustice we have experienced. We review the situation again and again and think of ways we can find retribution. We don’t look at the whole situation or try to understand our part in the interaction. Unfortunately, we may take action on our thoughts that may have negative consequences. • Magnifying – When we feel upset, we start thinking of reasons to explain our feelings. We may come up with a number of causes, all equally plausible, and some may be dramatic and not grounded in reality. We then take rash actions with negative consequences, such as quitting our job, ending a friendship, or acting out our bad mood. • Chaos – Sometimes we feel overwhelmed and our thoughts dart from one focus to another without any clear theme. 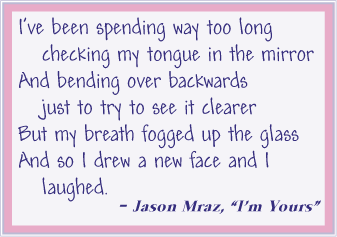 We end up feeling disoriented – and we may shut down or run away from our problems. Rumination should not be confused with other types of thinking. •	Rumination is not the same as worry, although ruminators do worry. Worry involves “what if’s” – wondering about things that might happen (“What if I say the wrong thing at work?” “What if this date goes wrong?”). Rumination, on the other hand, focuses more on things that have happened in the past – like things you said or things that went wrong. •	Rumination is not the same as obsessive-compulsive disorder. OCD involves a preoccupation with thoughts that are external, like germs, and how they might intrude on us. Ruminators can turn these thoughts off easily. •	And rumination is not like the thinking that goes on in therapy. One thing that therapy might do is to focus on effective problem-solving, including looking at situations in a different way and finding ways to take action to solve problems. Ruminators focus on one way of looking at a problem and they seldom get to the point of solving the problem. 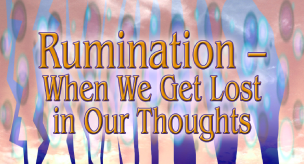 How Do We Overcome Rumination? Rumination is an elusive experience. We get caught in the ruminative pattern without realizing it and then assume that this is the way things are supposed to be – thinking and thinking endlessly. We slip into the pattern automatically and feel that we have no control over it. The experience can feel agonizing, but may also seem familiar and comfortable. It does not solve the problems that we are anxious about, and in fact it ultimately increases our anxiety and may lead to depression. Research has found that engaging in a pleasant distraction is a good way to open the way to effective problem-solving. The use of distraction from rumination can improve our mood and lead to positive thinking. Even a few minutes of distraction can have long-term effects. Some people use exercise as a distraction. A walk around the block, swimming, gardening, or a workout at the gym are all positive distractions from rumination, as well as a hobby that requires us to pay attention to what is happening in the moment. Reading can be a good distraction. The goal is to break the rumination and to focus on something else. Of course, we need to realize that a distraction is not the same as escaping from a problem. For example, alcohol or other substance abuse, losing oneself in videogames, or binge eating are not healthy distractions. When rumination takes over, cultivate the ability to observe yourself from a distance. Ask yourself, “What am I doing?” “Isn’t my thinking like this just a way of giving the power to the other person?” “I’m letting the other person control me.” Redefining your overthinking in this way gives you a sense of power over it. Take this method to the next step – come up with different ideas that truly allow you to solve the problem constructively. Try to see the issue from the other person’s point of view. Redefine the problem using more positive thoughts. If you allow yourself to ruminate, it can take up your whole day. From morning to a sleepless night, you ponder your situation endlessly. It takes over your life and you do have other responsibilities. Tell yourself that you will allow yourself only an hour per day to ruminate. Choose an hour when you normally feel good (and this should not be right before going to bed). When the urge to ruminate appears, tell yourself that you will put it aside and save it for your “thinking hour.” Many people find that because they are now spending most of their days free from ruminating, the problems seem less overwhelming during the hour of thinking. Rumination is a private experience and we seldom share the thoughts we harbor with other people. We generate thoughts that may have little basis in the real world. You can break this pattern by sharing your thoughts with a trusted friend, family member, or therapist. This person can ask relevant questions, such as, “What was your mood before you started thinking about this?” You can listen to their feedback and ask questions – and this will allow you to see your issues in a new light and gain new perspective. Make sure that the person you talk to is stable. If you choose a person who simply fans the flames of your thoughts, you will accomplish nothing and may drift further into your ruminative thoughts. A lthough the techniques we have reviewed work in the short run, rumination may return during times of stress or when a crisis comes into your life. Let’s look at some ways to replace the old ruminative pattern with more positive approaches. Adopting these strategies, which will take time and can be learned with the help of a professional therapist, can free you from rumination and help you move to higher ground over time. Learn to avoid the triggers – You can learn to identify the situations that lead to rumination – and to avoid them. For example, if spending time with a friend leads to overthinking, limit the time you spend with this particular friend. Let go of unrealistic goals – Learn to assess whether your life goals are realistic or not. Holding on to unrealistic goals drives rumination. But redefining them into goals that can be accomplished realistically can free you from overthinking. Indulge yourself in different ways – Instead of going into ruminative thought when you feel stressed, learn alternate methods. For example, physical exercise, a bubble bath, talking with a trusted friend, nature walks, prayer, or meditation can all be used instead. Develop your narrative – Reviewing your life and seeing it in a new, whole, and meaningful way can provide insights and different perspectives during times of stress. Working on your narrative with a therapist can lead to a permanent change in how you handle life’s challenges. Expand your range of activities – Rumination is more probable when our lives are limited. If your work has taken over your life, try doing volunteer work or getting into a hobby in a completely different setting. Or you might consider making new friends. Define your life in positives, not negatives – Rumination thrives when we see ourselves in negative terms. Learn to change the negative interpretations of your life into positives. Instead of focusing on failures in your life, highlight the successes. This method, in itself, can lead you to the joy and happiness in life that you truly deserve. Susan Nolen-Hoeksema. Women Who Think Too Much. New York: Henry Holt and Company. 273 pages, paperback, $15.00. ISBN-13: 9789-0-8050-7525-0.